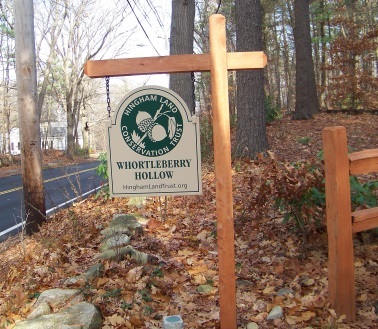 Whortleberry Hollow is one of several selections of hiking trails on Cushing St. in Hingham. 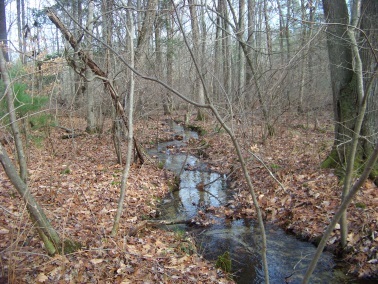 This property is owned by the Hingham Land Conservation Trust and is part of the Parklands for the Public. 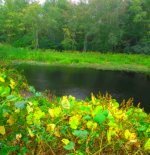 around a hollow of wetland. It starts off at some stone steps at a well marked entrance between 424 and 444 Cushing St. Parking for this area is a bit limited. I found that parking along side the road opposite the entrance worked well. Only a couple of cars can fit here though. 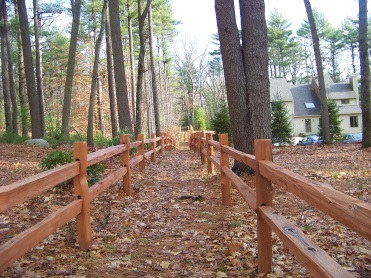 The trail leads you through the narrow access to the property by a fenced walkway. At the end of this walk way you will find a kiosk with info about the park and a trail map. 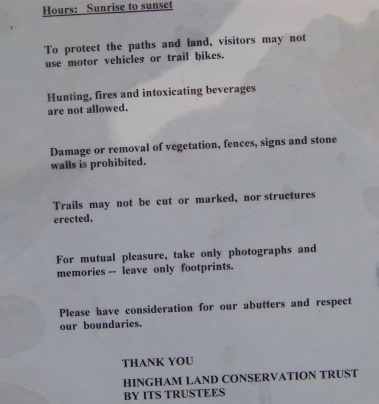 An official Parklands For Public map can be obtained by joining the Hingham Land Conservation Trust and asking for the map or obtaining one at the town hall. At the kiosk the hiking trail that encircles the property begins. The trail is well marked, wide and mostly level. 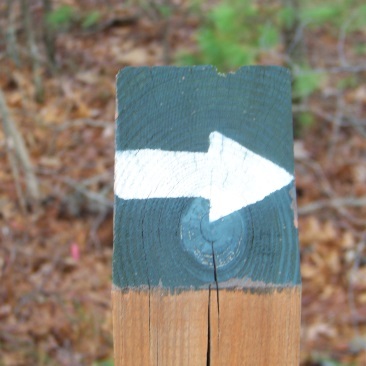 Throughout the property there are posts marked like this one to guide your way. measures just over 1/10 miles. 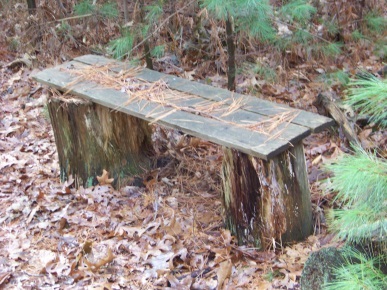 Dotted throughout the property are benches. and follows the edge of the meadow. Here it becomes a bit more rugged. 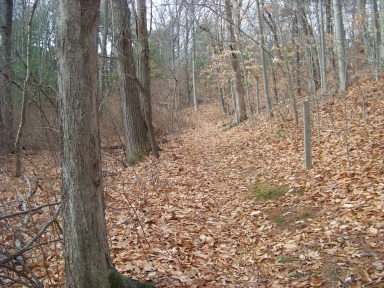 The trail leads downhill and in late November is covered with leaves. There are hidden roots under the leaves making this portion an area where those hiking need to exercise a bit of caution. The hiking trail levels for a bit then starts another downhill track, this time with the aid of railroad ties acting as stairs which are needed as it becomes more steep than the first hill. It now runs through a stand of young pine and downhill once again through an area that looks like wetland. After this the hiking trail climbs slightly and passes through a stone wall. It then passes over a lively flowing stream by way of an older style culvert. The water that flows through here looks exceptionally clear! Just after this crossing there is a trail junction and a bench. The main trail continues to the left and if looking on the map the leg that follows the stream leads right here. What isn't on this map, but is included on the map in the forest is an additional trail junction just a few feet down the leg trail. A separate trail leads to the right, at this additional junction. It comes to the place marked" hill" on the online map. 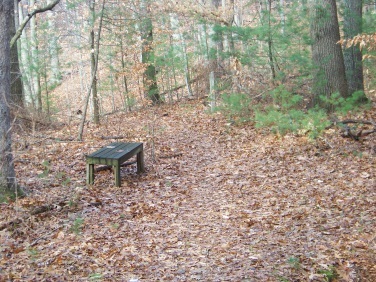 Here there will be another bench and the trail stops though it looks like on should continue on. Before it does so it crosses the stream once again. clearness of the water is incredible. The other portion of the leg trail does the same, but on the map it shows it makes a narrow loop. It comes very close to some private property so I never saw the loop. I usually turn around when trails come close to private property! Exploring the "leg" portion and other trail leading off of it add an additional 1/2 mile to the hike. 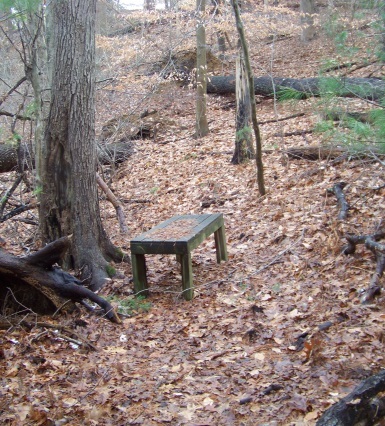 The main trail leads away from the stream and bench along the bottom of what the map calls the Birch Hill. It continues mostly at the bottom up along the hill itself. 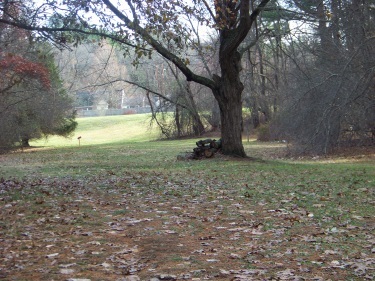 Soon the fence that runs along a private driveway can be seen to the right. 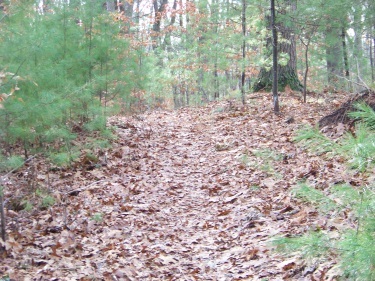 The trail climbs slightly then turns left into the forest further. Soon after, the entrance trail will come on the right but it is not easily identified as the entrance trail. I almost continued on for a second tour around the hollow!! Not that that would be a bad thing! The total mileage around the hollow and the exploration came out to be about 1 1/10 miles. Directions: exit 15 off route 3 heading south on Derby Street. After passing the Derby Street shops, take a left on Cushing St. at the next set of lights. Cushing will intersect route 53 and approx. 1/2 mile on the right the trail head sign will appear.